All options that take a “Date” can handle a Date object; a String formatted according to the given format; or a timedelta relative to today, eg “-1d”, “+6m +1y”, etc, where valid units are “d” (day), “w” (week), “m” (month), and “y” (year). Use “0” as today. There are also aliases for the relative timedelta’s: “yesterday” equals “-1d”, “today” is equal to “+0d” and “tomorrow” is equal to “+1d”. Most options can be provided via data-attributes. An option can be converted to a data-attribute by taking its name, replacing each uppercase letter with its lowercase equivalent preceded by a dash, and prepending “data-date-” to the result. For example, startDate would be data-date-start-date, format would be data-date-format, and daysOfWeekDisabled would be data-date-days-of-week-disabled. Whether or not to close the datepicker immediately when a date is selected. If true, manually-entered dates with two-digit years, such as “5/1/15”, will be parsed as “2015”, not “15”. If the year is less than 10 years in advance, the picker will use the current century, otherwise, it will use the previous one. For example “5/1/15” would parse to May 1st, 2015, but “5/1/97” would be May 1st, 1997. Whether or not to show week numbers to the left of week rows. 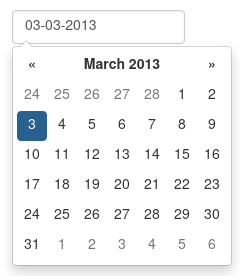 If true, displays a “Clear” button at the bottom of the datepicker to clear the input value. If “autoclose” is also set to true, this button will also close the datepicker. Days of the week that should be disabled. Values are 0 (Sunday) to 6 (Saturday). Multiple values should be comma-separated. Example: disable weekends: '06' or '0,6' or [0,6]. Days of the week that should be highlighted. Values are 0 (Sunday) to 6 (Saturday). Multiple values should be comma-separated. Example: highlight weekends: '06' or '0,6' or [0,6]. Date to view when initially opening the calendar. 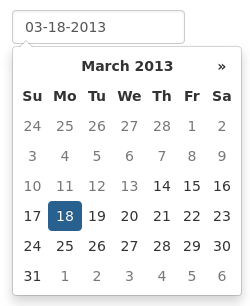 The internal value of the date remains today as default, but when the datepicker is first opened the calendar will open to defaultViewDate rather than today. If this option is not used, “today” remains the default view date. A date, which should be in local timezone. A string which must be parsable with format. If false the datepicker will not show on a readonly datepicker field. The latest date that may be selected; all later dates will be disabled. Date should be in local timezone. String must be parsable with format. Will disable all dates after today. Whether or not to force parsing of the input value when the picker is closed. That is, when an invalid date is left in the input field by the user, the picker will forcibly parse that value, and set the input’s value to the new, valid date, conforming to the given format . The date format, combination of d, dd, D, DD, m, mm, M, MM, yy, yyyy. d, dd: Numeric date, no leading zero and leading zero, respectively. Eg, 5, 05. D, DD: Abbreviated and full weekday names, respectively. Eg, Mon, Monday. m, mm: Numeric month, no leading zero and leading zero, respectively. Eg, 7, 07.
yy, yyyy: 2- and 4-digit years, respectively. Eg, 12, 2012. * but textbox should store the actual date. If true, selecting a year or month in the datepicker will update the input value immediately. Otherwise, only selecting a day of the month will update the input value immediately. A list of inputs to be used in a range picker, which will be attached to the selected element. Allows for explicitly creating a range picker on a non-standard element. Only effective in a range picker. If true, the selected value does not get propagated to other, currently empty, pickers in the range. Whether or not to allow date navigation by arrow keys. Keyboard navigation is not supported at all for embedded / inline mode. Also it’s not working if input element hasn’t focus. This could be an issue if used as component or if opened by show method. The IETF code (eg “en” for English, “pt-BR” for Brazilian Portuguese) of the language to use for month and day names. These will also be used as the input’s value (and subsequently sent to the server in the case of form submissions). If a full code (eg “de-DE”) is supplied the picker will first check for an “de-DE” language and if not found will fallback and check for a “de” language. If an unknown language code is given, English will be used. See I18N. Set a maximum limit for the view mode. Accepts: 0 or “days” or “month”, 1 or “months” or “year”, 2 or “years” or “decade”, 3 or “decades” or “century”, and 4 or “centuries” or “millenium”. Gives the ability to pick only a day, a month, a year or a decade. The day is set to the 1st for “months”, the month is set to January for “years”, the year is set to the first year from the decade for “decades”, and the year is set to the first from the millennium for “centuries”. Set a minimum limit for the view mode. Accepts: 0 or “days” or “month”, 1 or “months” or “year”, 2 or “years” or “decade”, 3 or “decades” or “century”, and 4 or “centuries” or “millenium”. Gives the ability to pick only a month, a year or a decade. The day is set to the 1st for “months”, and the month is set to January for “years”, the year is set to the first year from the decade for “decades”, and the year is set to the first from the millennium for “centuries”. Enable multidate picking. 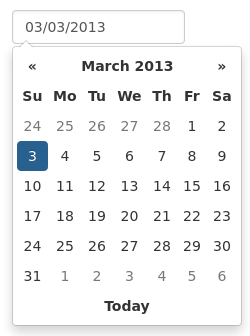 Each date in month view acts as a toggle button, keeping track of which dates the user has selected in order. If a number is given, the picker will limit how many dates can be selected to that number, dropping the oldest dates from the list when the number is exceeded. true equates to no limit. The input’s value (if present) is set to a string generated by joining the dates, formatted, with multidateSeparator. The string that will appear between dates when generating the input’s value. When parsing the input’s value for a multidate picker, this will also be used to split the incoming string to separate multiple formatted dates; as such, it is highly recommended that you not use a string that could be a substring of a formatted date (eg, using ‘-‘ to separate dates when your format is ‘yyyy-mm-dd’). A space-separated string consisting of one or two of “left” or “right”, “top” or “bottom”, and “auto” (may be omitted); for example, “top left”, “bottom” (horizontal orientation will default to “auto”), “right” (vertical orientation will default to “auto”), “auto top”. Allows for fixed placement of the picker popup. “orientation” refers to the location of the picker popup’s “anchor”; you can also think of it as the location of the trigger element (input, component, etc) relative to the picker. “auto” triggers “smart orientation” of the picker. Horizontal orientation will default to “left” and left offset will be tweaked to keep the picker inside the browser viewport; vertical orientation will simply choose “top” or “bottom”, whichever will show more of the picker in the viewport. 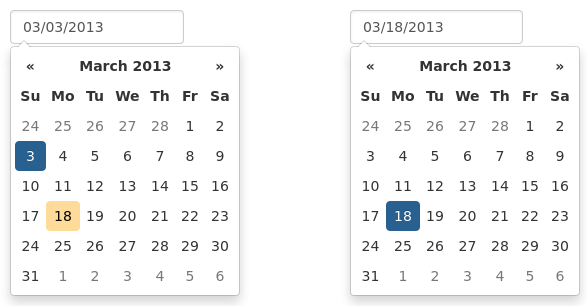 If false, the datepicker will be prevented from showing when the input field associated with it receives focus. The earliest date that may be selected; all earlier dates will be disabled. 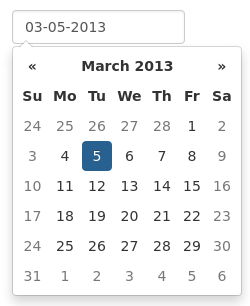 The view that the datepicker should show when it is opened. Accepts: 0 or “days” or “month”, 1 or “months” or “year”, 2 or “years” or “decade”, 3 or “decades” or “century”, and 4 or “centuries” or “millenium”. Useful for date-of-birth datepickers. If false, the datepicker will not append the names of the weekdays to its view. Default behavior is appending the weekdays. 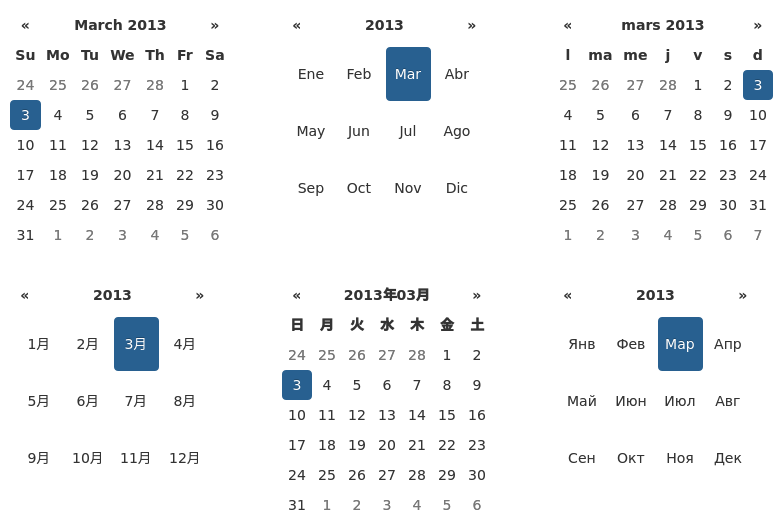 The string that will appear on top of the datepicker. If empty the title will be hidden. If true or “linked”, displays a “Today” button at the bottom of the datepicker to select the current date. If true, the “Today” button will only move the current date into view; if “linked”, the current date will also be selected. If true, highlights the current date. 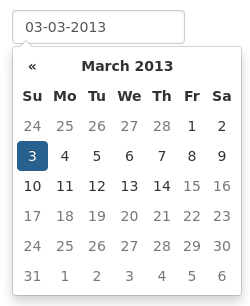 If true, selecting the currently active date in the datepicker will unset the respective date. This option is always true when the multidate option is being used. If false viewDate is set according to value on initialization and updated * if a day in last oder next month is selected or * if dates are changed by setDate , setDates , setUTCDate and setUTCDates methods. If multidate option is true the last selected date or the last date in array passed to setDates or setUTCDates is used. The CSS z-index of the open datepicker is the maximum z-index of the input and all of its DOM ancestors plus the zIndexOffset. © Copyright 2016, eternicode Revision 9252578f.